Learn about the new program to help young people who want to start a business train to become entrepreneurs. Business Works Youth is a 3 month Federal/Provincial training program for 15 – 29 YOs who have not made an EI claim in the last 3 years, are un- or under-employed (less than 20 hours of work per week) and are not in school. The trainee will develop a business plan which is reviewed by a panel of local business consultants. 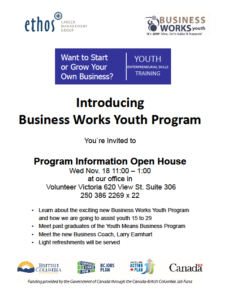 Come to the open house in our new location in the Volunteer Victoria offices at 620 View St.
Meet graduates of the predecessor program, Youth Means Business and some of the volunteers from the business community.